Leersia virginica.© Fontenelle Nature Association.www.fnanaturesearch.org. (Accessed 6/2014). 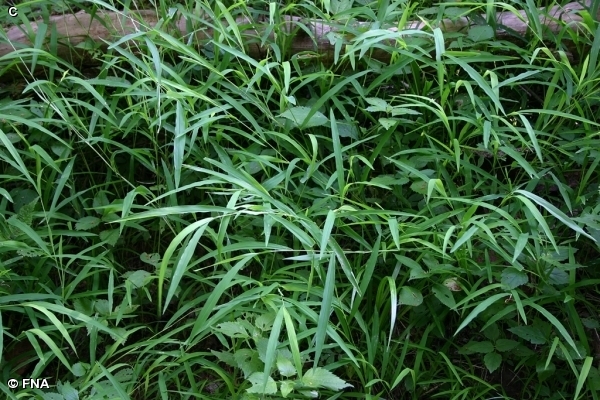 Leersia virginica is a perennial C3 grass (Basinger 2002), 50 cm to 1.5 m long, sprawling, branching, colonial, from short, thick rhizomes, stems rooting at nodes when in contact with soil (never forming stilt roots), nodes usually finely hairy. 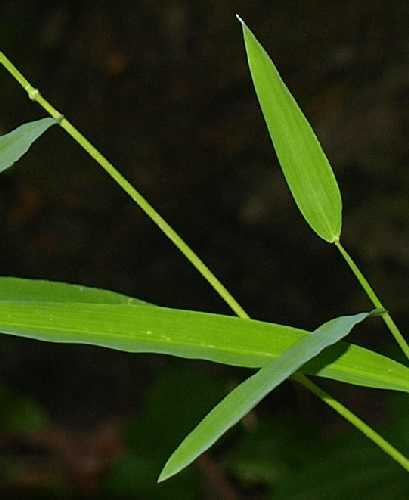 Leaves with sheaths smooth to somewhat rough, ligule membranous, short, blunt; blade 5-20 cm long, 0.3-1.5 cm wide, bright yellow-green, slightly raspy-textured. Flower spikelets 1-flowered, 0.3-0.4 cm, slightly overlapping, inflorescence delicate, branches solitary, distant; blooming and fruiting July-Oct.
Habitat: Moist to wet woods, especially in disturbed areas along paths, , soil pH 4.5-8.5, quite shade tolerant, intolerant of fire, salt, drought (USDA, NRCS 2010). Notes: Fed upon by larvae of the Northern Pearly Eye butterfly, Enodia anthedon (Hilty 2006). Often now found with the invasive annual Japanese stilt grass, Microstegium vimineum. The two are quite alike but Leersia is a fimly rooted perennial with slightly raspy leaves, usually has hairy nodes, and never has long stilt roots.